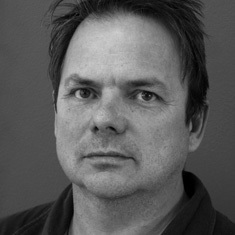 Brett Murray was born in Pretoria in 1961. From 1985-1989 he studied at the Michaelis School at the University of Cape Town (UCT) where he obtained a Bachelor and Masters Degree in Fine Arts with a specialization in sculpture. In 1992, he established the sculpture department at Stellenbosch University. He has participated in a vast number of exhibitions, including the Venice Bienalle in 1995, the Cuban Bienalle and at the Frankfurt, Cologne and Basel Art Fairs. He has also curated various exhibitions around South Africa such as, "40 Sculptures of the Western Cape". In 1998 he won the Urban Arts Foundation Public Sculpture Competition for a work soon to be erected at the St. Georges Mall in Cape Town. Murray explores mixed media like steel and plastics to create sculptures that comment on the "rich and unique irony, particular and peculiar to South Africa." He inquires upon the clash between African and European cultures in the old and new South Africa, and is critical and satirical, intending to bring about consciousness and a shift of perspective in people’s narrow viewpoint. In 1997, Murray began to address his own identity with pieces like “Guilt and Innocence 1962-1990”, which was made for the 'Thirty Minutes' exhibition on Robben Island. He collected pictures of himself taken during the years of the Rivonia Trial prisoners' sentences and explored his role in the unjust racist politics that the apartheid state imposed in his country. He explained, "I am a white, middle-class cultural hybrid. This was and is my comfortable and uncomfortable inheritance. The political and social force beyond the confines of my family formed a system which protected and infringed on me, empowered and disempowered me, promoted and denied me." He has participated in several other critical and introspecting expositions. 'Own', at the Goodman Gallery, focused on steel cut-outs derived from historical drawings of landscapes, combined with jars of soil, small paintings and engraved plaques with words like "Heritage" and "Possession”. He also participated in a group exhibition, 'Liberated Voices', at the Museum for African Art in New York in February 1999. Murray also participated in the exhibition called 'The New Republics', with other South African, British, Canadian and Australian artists, which took place in London. In April 2003, he questioned the issues pertaining to his racial heritage in "White Like Me: Brett Murray". In 2005, he published a book with Sean O’Toole entitled Brett Murray: plasticien. He now lives and works in Cape Town.